English: Invaders of the Rokujouma!? Published: Mar 1, 2009 to ? Due to young Koutarou's financial circumstances, he is forced to live in a small rokujouma (6-tatami apartment) on a budget of 5000 yen a month. On the plus side, he lives rent-free, but on the minus side, that's because room 106 of Corona Apartments is cursed. The ghost is a cute young girl and hijinks ensue when she tries to drive him out. Between the haunting, Koutarou's nosy neighbors, and a self-styled magical girls flying to the unneeded rescue, there's way too much for the impoverished young man to handle. Rokujouma no Shinryakusha!? has been published digitally in English as Invaders of the Rokujouma!? by J-Novel Club since June 3, 2017. Alternative version: Rokujouma no Shinryakusha!? Adaptation: Rokujouma no Shinryakusha!? PV, Rokujouma no Shinryakusha!? Rokujouma no Shinryakusha is much more than it seems at first glance. Starting this novel I expected average harem and instead got greatly written story with incredible characters. Story setting feels very ordinary at first: normal boy starts living alone in a cheap apartment. But with every girl introduced it becomes more and more crazy. It actually gets to the point of being pretty ridiculous, but, surprisingly, story never becomes random and there are no plot holes. Author does great work at connecting all loose ends and foreshadowing events that will happen much later. Nothing happens without a reason. The most important part of this story are characters. Not only because it's a harem, but because whole storyline is build on their stories. 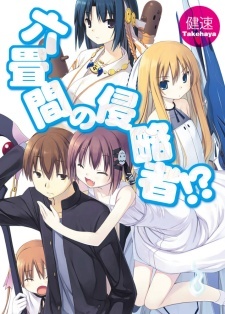 Unlike usual harem where backstories of heroines are just side chapters and main plot is focused on single girl, Rokujouma no Shinryakusha connects all, seemingly unrelated, stories into one great, detailed and epic story with some good character-based comedy. Characters themselves get a lot of development. They discover their past, defeat their weaknesses and mature. All the girls have good reasons to be in harem and those reasons often evolve as they mature. At the center of the story is our protagonist - Koutarou Satomi. He is just normal, and I mean that in a good way. He isn't one of those "good at nothing, but nice" guys, nor is he someone with hidden dark past. He has his strengths and weaknesses balanced in a way that make him feel believable - you can actually imagine person like him living next door. Author made great use of Koutarou as a focal point of the story. He becomes catalyst for other characters development as he gradually uncovers their stories and help them overcome obstacles. That normal boy, by getting involved with with invader girls, becomes main character of their respective stories and connect them in most unpredictable ways. Writing about art in novel might sound strange, but Rokujouma no Shinryakusha's illustrations deserve a mention. The way characters are portrayed in them helps a lot with imagining their actions and expands on author's character building. Their looks fit their personalities perfectly. What I can say for sure is that Rokujouma no Shinryakusha is the most enjoyable novel I've read so far. Great story moving in the most unpredictable ways, awesome characters that never stop developing and very solid protagonist at the center of it all makes reading this novel a pure pleasure. I don't remember any boring moments or stupid decisions made just to push the plot. When it comes to enjoyment, I'd say Rokujouma no Shinryakusha is simply flawless. Rokujouma no Shinryakusha!? is really a wonderful series. There is just a charm that you cannot get from anywhere here. The story is about the man named Satomi Koutarou who is moved into a cheap dorm when he get into high school. But it's not only him that want to be on that room. Little by little girls unexpectedly start appearing and stating their own reason in order into having that room. First is ghost girl named Sanae who are already there from the start before Koutarou moving then followed by mahou shoujo Yurika who is stating that she come to protect the room because it have large magical power and bad guys are targeting it. After that alien princess Theia come with her attendant Ruth who want to claim that room in order to finish a trial she is having followed by underworld people Kiriha who want to build altar to create a weapon there. Thing have rocky start with each of them don't want to back down but ultimately it's landlord Shizuka intervene and create a deal to make a competition over the room instead of open hostility. The story itself take it's time exploring each of it's character personality and motivation. For about 6 volume is dedicated into exploring all of that and all of it are worthwhile journey. It's not just that as well but there is an increase mystery on Koutarou own identity and his ties to the girls story. Over the time Koutarou realize that the girls not only invaded the room but they are slowly and surely invaded his own heart too. The character itself grow really well. Sanae who is at first just want to have her own room back open up to other and realize that at some point they are not stranger any more to her but already become part of her family. Yurika a timid mahou shoujo grow in confidence and become someone worthy of succeeding her predecessor. Theia grow from a spoiled child into noble princess. And Kiriha who is too mature of her age open up and show her vulnerable side from time to time. Not to forget about Koutarou who grow into splendid knight. Together instead of being enemy they are at the start they form a tight bond instead and become closer than family. Overall this story is for those who enjoy to take their time to invested into each of the character that are present. The overarching mystery and likable cast also can keep you glued into this series. I'm recommending this to someone who enjoy character focused story and to everyone that just want a pleasant thing to read.